N.C.A.I. 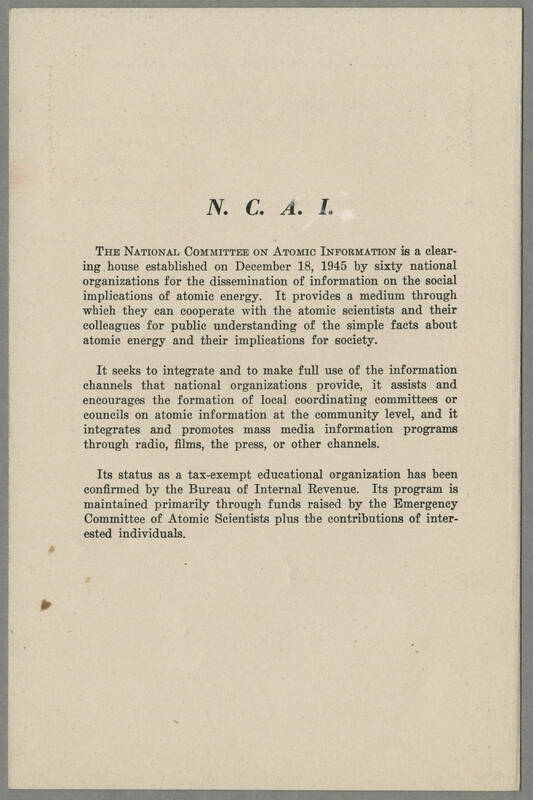 THE NATIONAL COMMITTEE ON ATOMIC INFORMATION is a clearing house established on December 18, 1945 by sixty national organizations for the dissemination of information on the social implications of atomic energy. It provides a medium through which they can cooperate with the atomic scientists and their colleagues for public understanding of the simple facts about atomic energy and their implications for society. It seeks to integrate and to make full use of the information channels that national organizations provide, it assists and encourages the formation of local coordinating committees or councils on atomic information at the community level, and it integrates and promotes mass media information programs through radio, films, the press, or other channels. Its status as a tax-exempt educational organization has been confirmed by the Bureau of Internal Revenue. Its program is maintained primarily through funds raised by the Emergency Committee of Atomic Scientists plus the contributions of interested individuals.